Also posted in Blog, Events, Featured, Uncategorized, What's New? 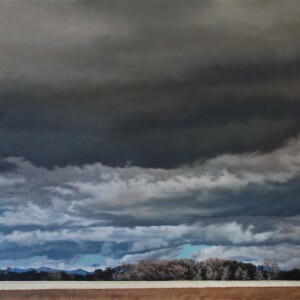 Tiers of a Storm has been submitted to the Colorado Public Arts projects for consideration to be included in the collection of a local institution, Adams State University. 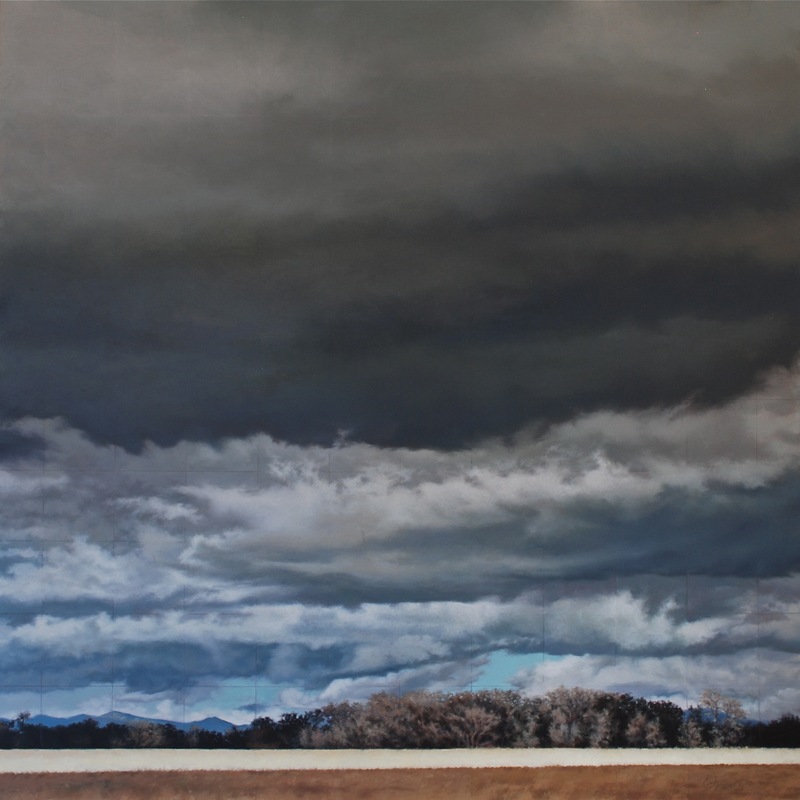 More than a typical sky-scape which the San Luis Valley is known for, this painting is also about the agricultural lifeblood of this area. The grid pattern which recedes into the clouds throughout the piece represents the inorganic grid pattern of the SLV, which creates a land of one-mile, perfected, quilt-like squares in what is otherwise a harsh and wild climate. The cut wheat slashes a bright accent line under a cold, threatening sky. The San Luis Valley is a land of contradictions, as is this painting. 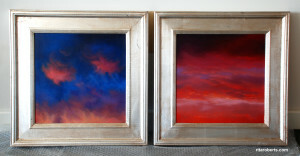 Not only in its composition, but as one still moment captured in paint, but when viewing it, the clouds appear to move. Also posted in Blog, Creative Process, Events, Featured, Uncategorized, What's New? an exhibit with the artwork of Rita Roberts and photographs of Andoni Canela. Show will be on view through the holidays. Twenty-two paintings and photographs that reflect the incredible diversity of the San Luis Valley will be on view at Firedworks Gallery in Alamosa. 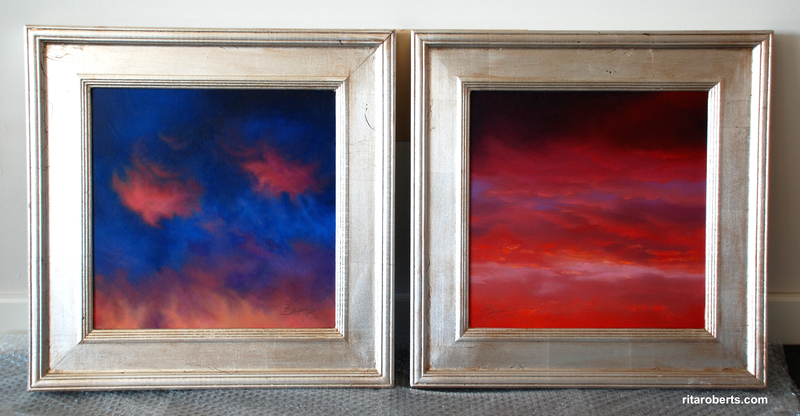 Two masters experience and observe together, the rhythms of art and nature, as an integral part of their creations. Each, in their own way, generate images in devotion to the wild, as well as the personal. Both artists have contributed to land and wildlife conservation efforts. 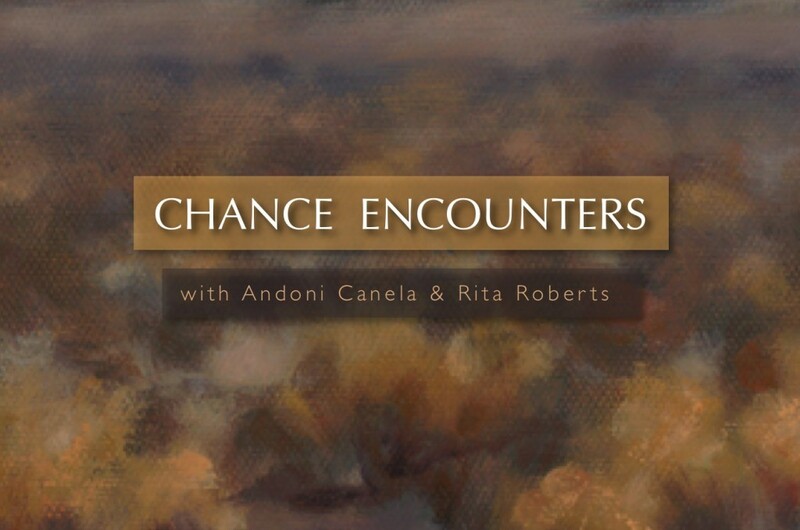 The Chance Encounters collection includes habitats protected by the Rio Grande Headwater’s Land Trust (RiGHT), the Nature Conservancy, Great Sand Dunes National Park, Monte Vista and Alamosa Wildlife Refuges, and Colorado State Wildlife areas. For 20 years, Andoni Canela has been working as a wildlife photographer, traveling throughout the world in search of endangered species – such as polar bears, grey whales, Bengal tigers, Iberian wolves, pandas, grizzlies, condors and quetzals. His photographs have been published in National Geographic, Time, Geo, The Sunday Times, Newsweek, La Vanguardia and El País. He is the author of a dozen books and has made several expeditions to the Arctic, Amazon, Himalayas and the savannas of Africa. Beginning in the summer 2013 he has a touring exhibition with his 5 year work on the Arctic. This exhibition will be on view in more than 40 cities in Spain. 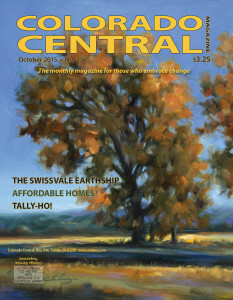 Artist, and long-time resident of Monte Vista, Rita Roberts, has teamed up with this master photographer. As a naturalist and landscape painter, Rita’s work has gained national attention. She is a signature member of Oil Painters of America and has been featured in national publications including, Southwest Art, American Art Collector, and The Artist’s Magazine. She holds a BFA from the Kansas City Art Institute and will complete an MFA at the Academy of Art University in 2014. She shows regularly in prestigious exhibits like Salon International in San Antonio, Women Artists of the West Invitational, Tucson and Wendt Gallery Invitationals in Laguna Beach. Also posted in Blog, Events, Featured, What's New? The thermometer outside reads nine degrees — not a morning I would normally emerge from beneath my goose-down comforter before dawn. “Thank god it’s almost April,” I exhale and begin the dance of pulling chilled silk over my bare skin. Another layer of mohair, then thicker wool, and sturdy denim. I am meant for equatorial climates. A stranger on my couch also rises — acclaimed nature photographer, Andoni Canela. I’ve lured him here with alpine promises of buffalo herds, migrating sand hill cranes, and wintry slopes of the Southern San Juans. I found Andoni and his work on Facebook, of all places. From cyber-land to my doorstep, Andoni is the real deal, only smaller than I imagined. We’re almost the same size and I am decidedly petite. Now he rolls up his bedding, sleepy but smiling and ready to go. Like two little pixies, we tiptoe out into wee hours. Neither of us know what we’re in for. Frigid air slaps me awake. I absorb the beauty of predawn half-light.The huge expanse of fading stars presses down, sandwiching us against icy snow that blankets the valley in pinkish- lavender drifts. The cold envelops our heated truck and billows its exhaust. We’re alone on a silver-gray highway. This valley is like a small town starlet waiting to be discovered. She makes herself up, dons her finest gown, accentuates her features with jewels, but only a handful of churchgoers get to admire her. Today might be her big break. I hope she performs, for her sake…and mine. Andoni took me on my word that a five hundred mile detour would be worth his while. I had the nerve to invite him and he was brave enough to accept. Now it is time for the land to deliver. I’ve made phone calls, scoured maps, and gotten permission from land owners, but we are still at the mercy of this climate’s unpredictable moods. Neither copious prayers nor hopeful offerings can divert the Southern San Juan’s shedding of winter. Gusts and gales come as they must, and we are on the verge the windy season. Nowhere on earth is there a more miserable springtime. Our first turn is a wrong one. The sun inches toward the horizon and I realize that we’re supposed to be south of the river but north of the highway. That only involves about fifty yards of real estate, and the pasture we’re trudging through seemed a much more likely place to find a herd of buffalo. We backtrack. The sun and the stakes get higher. We’re on the verge of loosing our morning shoot. Finally, we locate the herd. I was assured that these bison are used to people, so we enter the small, fenced-in pasture hoping for close-up shots. However, the alpha male takes offense at our intrusion. He bounds to the edge of his group of females and offspring. Steam puffs from his nostrils in audible bursts. Two steps in our direction. I shed my camera pack, ready to drop it on the other side of the fence, but Andoni holds it for me. That bison shows us his trot. I scramble over wood and wire, shaking just a little. My companion is much quicker over the fence and we back up together as the bulk of four-legged fur huffs toward us at a full run. Did the builders of this livestock enclosure considered the force of a charging buffalo? The burly brute halts in an abrupt stop, exactly where we exited his territory. Right on cue, dawn breaks. Bravo. “Here we go,” Andoni whispers. Splendid, first light on a bison rancher’s menacing bull. Our packs drop and shutters click. The bison prances and poses for us in perfect, masculine, untamed power. So much between sunup and moonrise is completely outside our control. Despite initial mishaps, this day continues to grant one photogenic gift after another. Weather and clouds shroud the Sangre de Cristo Mountains with luxurious austerity. And later, a silent blizzard covers a wilder herd of two hundred shaggy-haired beasts; a classic, snow-covered vision of the American west. High praise in a Spanish accent. extraordinary spectacles, nature’s premier events. Still, my home has the power to move him. Now I claim it with a sense of prideful ownership. Neither of us knew what we were getting ourselves into. I expected to be his guide, but it was the handsome Spaniard who showed me where I might belong.